Yesterday the Big Ten Conference announced that Michigan and Michigan State, for the first-time in 110 meetings, will play their traditional in-state rivalry game in primetime on Oct. 7th. That means Under the Lights Part III at the Big House in Ann Arbor. (The Wolverines have played a pair of night games against Notre Dame at Michigan Stadium in recent years). That also means outrageous surge rates on hotels in and around Ann Arbor on Saturday night. A quick search of hotel rooms in town will have you shaking your head. The Sheraton and Graduate Ann Arbor? Sold out. The Courtyard by Marriott? Ditto. The Hilton Garden Inn, Residence Inn and Holiday Inn? Not a room to spare. If you do hope to stay in Ann Arbor that night, looks like your best bet is the Extended Stay America at Briarwood Mall … for a hefty $660 fee. “The real crime here, if you want to call it that, is not that the two schools are playing at night. The problem is that fans are left waiting to find out when the game is going to be played. This doesn’t matter for students who will go to the games no matter the kickoff time … It does matter however for fans who might be traveling in from out of town or fans who aren’t crazy about driving on I-94 or M-23 into the wee hours of the morning, especially given the outside chance that some of the fans have been over-served. There is nothing like enjoying a fall Saturday game at your alma mater surrounded by friends and family. There is also nothing like sleeping in your own bed after the game. Trust us. Or just ask around. 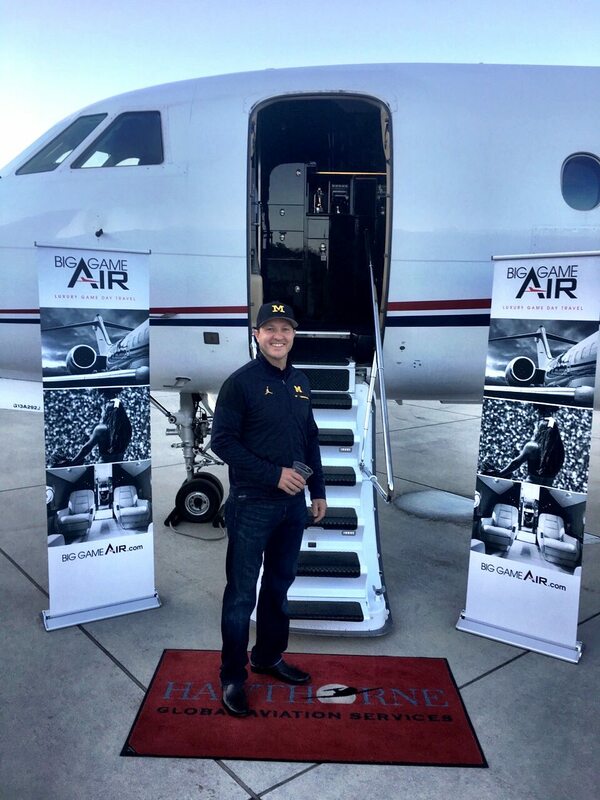 After our first trip to Ann Arbor this season for Michigan’s home opener, our customers raved about the seamless, time efficient and luxurious experience they had with Big Game Air. The same-day trip eliminated the need for a hotel and also eliminated countless headaches fans typically encounter on gameday. U of M grad Kurt Newsom, who wanted to spend his Saturday night back home with his wife and children, concurred. “It’s worth every penny and every minute,” he said. So what is all included in a Big Game Air trip? For starters, all Big Gam Air packages include round-trip travel via 10-16 passenger private jets, complimentary in-flight drinks and snacks (including alcoholic beverages for adults over the age of 21) and first-class ground transportation to and from the stadium. Every Michigan home game also includes a pregame VIP Tailgate in the Champions East Lot just steps away from the tunnel at Michigan Stadium. The Big Game Air Official Tailgate includes traditional food and beverage offerings and chances are you’ll run into at least one or two former Wolverine greats at our tent. Radio announcers Dan Dierdorf and Jim Brandstatter, Jon Jansen, captain of the 1997 National Championship team and All-American wide receiver Braylon Edwards are just a few of the regulars at our pregame party. You never know who might join a Big Game Air flight, too. Kansas City Chiefs rookie wide receiver Jehu Chesson jumped onboard our inaugural flight to Ann Arbor and we are pleased to have former captain and Super Bowl Champion Marlin Jackson join us for the Battle for the Paul Bunyan Trophy against the Spartans. Bears Pro Bowler Jerry Azumah will be headed to Green Bay with our customers on Thursday night as the Bears battle the Packers and former Notre Dame signal caller Jimmy Clausen is slated to join us when the Fighting Irish host College Football Playoff contender USC on Oct. 21. Traveling with Big Game Air is truly a one-of-a-kind experience from start to finish. Sick of waiting in long lines at the airport? Simply arrive a few minutes before your scheduled departure time, park your car at the hangar and hop on the plane. Once on the ground, we will drop you off mere steps from the stadium. After an action-packed game (and hopefully a win for your favorite team), our luxury ground transportation will pick you up at a convenient location and shuttle you back to the airport, where you’ll quickly get off the ground and back home in time to enjoy the rest of your evening — and sleep in your own bed. We can’t wait to travel to Ann Arbor to watch the Wolverines and Spartans battle at the Big House. It’s a rivalry built on emotion and you can throw records out the window when these two Big Ten East rivals collide. The atmosphere will be electric. The environment will be second to none. And when all is said and done, one team will strut into the postgame press conference with bragging rights for the whole year. Our customers? Thanks to a 35-minute flight – instead of the four-plus hour drive in traffic — they’ll be happily back home in Chicago by the time those postgame press conferences wrap up … Happy Wife, Happy Life! Interested in catching a game this fall? Check out our full list of upcoming games and events by clicking here.